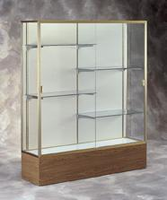 Showcase your greatest objects and awards with a display case from TrophyCentral. 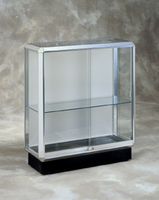 With our wide selection of display cases, you'll be sure to find what you need for your school or office. Whether it is a big case or small, they are all the highest quality and will make your space complete. 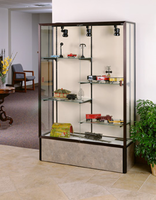 For color samples and general information on any of these display cases, Click here. Heritage Floor DisplayMeasures 36"L x 40"H x 14"D.
Keepsake Display CaseSliding or hinged top, straight or t-legs. Available in two sizes. Merchandiser SeriesAvailable in multiple sizes. Keepsake Series Measures 24"L x 72"H x 24"D (Includes 12" base). 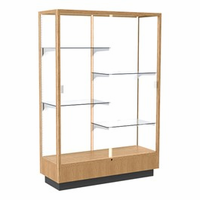 Classic Reliant Series Trophy CasesMeasures: 48"L x 72"H x 16"D.
Classic Reliant Display CasesMeasures: 60"L x 72"H x 16"D.
Monarch Series Trophy CaseAnodized aluminum framing secures the tempered glass doors and built-in lock. Varsity 694 Display CaseShown in Carmel Oak with Oyster Plaque Fabric back. 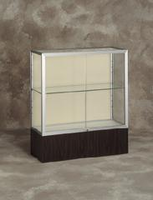 Reliant Series Display CasesMeasures: 72"L x 72"H x 16"D.
Prominence Tower Display CaseMeasures 24"L x 78"H x 24"D.
Waddell Contempo 601 Floor-Standing Trophy CaseThis beautifully finished case measures 36L x 72"H x 14"D.
Waddell Contempo 602 Floor-Standing Trophy CaseThis beautifully finished trophy case measures 48L x 72"H x 14"D.
Challenger Series Trophy & Award CaseHeavy-duty construction for school and commercial use. Quantum 513 Tower Display CaseBuilt-in lighting! Quantum 512 Medium Size Floor DisplayShips in just 7 business days! Quantum 511 Large Floor Display CaseShips in just 7 business days! 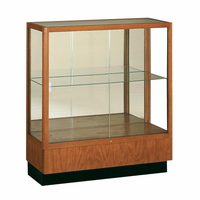 If you are looking for a commercial quality trophy or display case for your school or office, you have come to the right place! TrophyCentral carries the full line of Waddell Displays, one the leading trophy and display case manufacturers in the country. 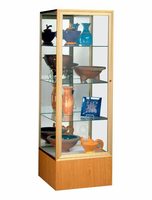 Our display cases are organized by section. The displays above are all floor standing models, but we also carry displays that can be mounted on the wall and specialty displays for coins and flags. Please click on an image above for more information, for example available display backs and finishes (many are available in several popular finishes to match your d�cor). Also see: wall-mounted trophy cases & display cases, ball holders & cases, brochure & literature displays, message centers, flag holders and more!